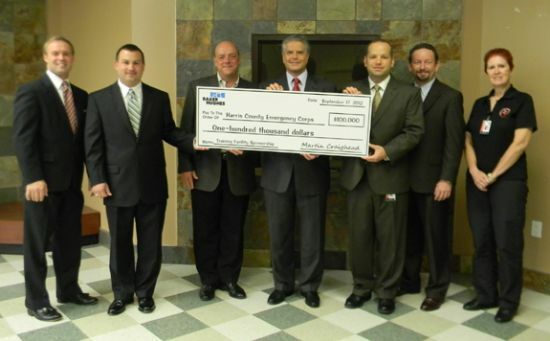 HOUSTN, Sep. 17, 2012 – Global oilfield services company Baker Hughes has generously donated $100,000 to local nonprofit Harris County Emergency Corps (HCEC) for the creation of the Baker Hughes–HCEC Education Center. The Education Center will be located at HCEC’s headquarters at 2800 Aldine Bender Road in Houston, Texas. The center will be used to educate HCEC and other local paramedics on new advances in prehospital medicine. It also will serve as a center for community education initiatives, such as community CPR, first aid/safety courses, and local community emergency response team classes. HCEC and Baker Hughes first began collaborating when Baker Hughes approached HCEC regarding training for its medical first responders for its Rankin Road campus in northern Harris County, Texas. That grew into training opportunities for other Baker Hughes facilities and mutual collaboration on community initiatives, such as this new Education Center. HCEC is a nonprofit, EMS provider in Harris County, Texas. The Corps primarily provides 911 responses to emergency medical calls to citizens of Northern Harris County and responds to approximately 18,000 calls for service each year (www.hcec.com). Baker Hughes is a leading supplier of oilfield services, products, technology and systems to the worldwide oil and natural gas industry. The company’s 58,000-plus employees today work in more than 80 countries helping customers find, evaluate, drill, produce, transport and process hydrocarbon resources. For more information on Baker Hughes’ century-long history, visit: www.bakerhughes.com. NORTHEAST – The East Aldine District was thanked for their support of the Aldine Scholarship Foundation with a huge luncheon, held last Wednesday, Sept. 12th at the Hyatt North Hotel. 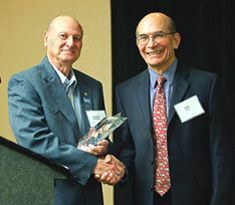 Receiving an award from ASF was the East Aldine chairman, Gerald Overturff. In turn, EAD showed a video of the accomplishments the district has brought since its inception in 2001, in line with its Service Plan to improve the quality of life in the district. Overturff mentioned that the district recently purchased a large tract of land in the center of his district, with the intent to build a Town Center that would include a facility for Lone Star College. He thanked his board and the Hawes Hill Calderon firm for their help in bringing improvements to the district. Also speaking at the ceremonies were Harris County Sheriff Adrian Garcia, thanking the district for its support of his department, and Aldine ISD superintendent Wanda Bamberg, announcing a major change in the relationship of ASF to the Aldine school district. The Aldine community bid farewell to the Aldine Scholarship Foundation (ASF), and welcomed the Aldine Education Foundation during the luncheon at the Hyatt North Houston Hotel on Wednesday, Sept. 12. Aldine ISD Superintendent Dr. Wanda Bamberg announced the formation of the Aldine Education Foundation at the ASF Community Star Luncheon, held in honor of the East Aldine Management District for its enhancement of the physical, social and economic well-being of the Aldine community over the last 11 years. East Aldine District recently contributed $60,000 to the ASF permanent scholarship endowment fund, for scholarships to students within the district. The event also served to raise additional contributions for ASF. Bamberg informed attendees that ASF will fall under the Aldine Education Foundation umbrella and will continue to provide scholarships to Aldine ISD graduates to attend any college in the Lone Star College System. Since its inception in 1991, ASF has provided 937 full-tuition scholarships to AISD graduates. As of spring 2012, ASF has more than $2 million in assets. “The fund will continue to be restricted to providing scholarships for Aldine ISD graduates to attend Lone Star College,” Bamberg said. “Fifty-three percent of students who graduate from Aldine ISD will attend college. Most of them will attend Lone Star College to earn an associate’s degree or as a gateway to four-year colleges and universities. ASF has meant so very much to our school district through the years. Bamberg added that the Aldine Education Foundation would expand opportunities for students to attend other colleges and universities in addition to Lone Star College. The Aldine Education Foundation will expand to include ASF and the ASF board will dissolve. Some members of the ASF board will serve on the newly created Aldine Education Foundation Board. Seth Sharr and Terry Williams of H-E-B serve as co-presidents of the Aldine Education Foundation. Sharr said he is excited about the new foundation and believes it will provide additional opportunities for Aldine students and staff. Individuals, businesses or corporations who would like to support the Aldine Education Foundation should call (281) 985-6078 or visit the Foundation website. The Aldine Education Foundation is a 501(c)(3) organization. Story by AISD’s Ben Wilson, and Gilbert Hoffman of the Northeast News. 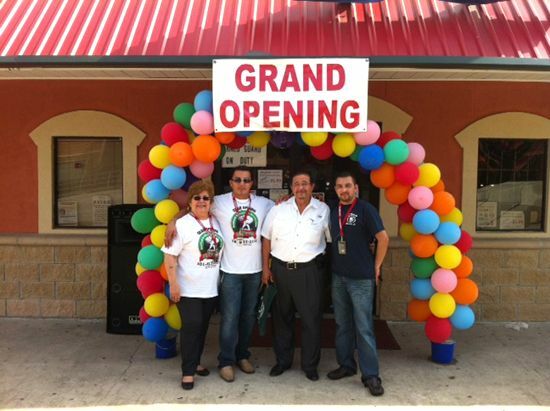 On August 25, 2012, a new Restaurant opened its doors to the Aldine community. El Peon Restaurant is a traditional restaurant serving seafood and Mexican food. El Peon Seafood & Mexican Restaurant has been opened by De Santiago Family, José, Gloria and their sons Luis and José; it’s located at 5158 Aldine Mail Rt., where the old Chinese restaurant used to be. Starting at 6 a.m., neighbors can enjoy a delicious breakfast everyday for only $1.99 until 10 a.m. and breakfast tacos are only 99¢. Lunch Buffet is from 11 a.m. to 5 p.m. and dinner from 5 p.m. to 9 p.m. (or closing) with “a variety of food, from seafood through Mexican food, sopas, enchiladas, tacos, chiles rellenos, most Mexican food,” said Gloria de Santiago. They also have “The typical caldo de res (beef soap), mole, beef stew,” said Jose de Santiago. They also served cauliflower and potatoes cakes [these are broiled cauliflower or potatoes then fried with eggs in a small cake form]. The list does not end in the food, El Peon Seafood & Mexican Restaurant also has desserts such as “the never left out cheesecake, choco flan, churros with cajeta,” said Gloria and her son Luis. One other thing that customer ask for is the “cheese empanadas,” Gloria added. For those who want something lighter to eat, there is a salad bar. El Peon Restaurant also has fresh fruit water of different flavors such as watermelon or seven-passion water with berries (antioxidant), coffee, tea, soft drinks and sodas. For seafood they offer whole fried tilapia, breaded shrimps and much more. Special is the burrito dinner and Karaoke which also is played on Friday from 6 pm – 10 pm, Saturday 6 pm to 12 pm and Sundays from 2 pm to 8 pm. 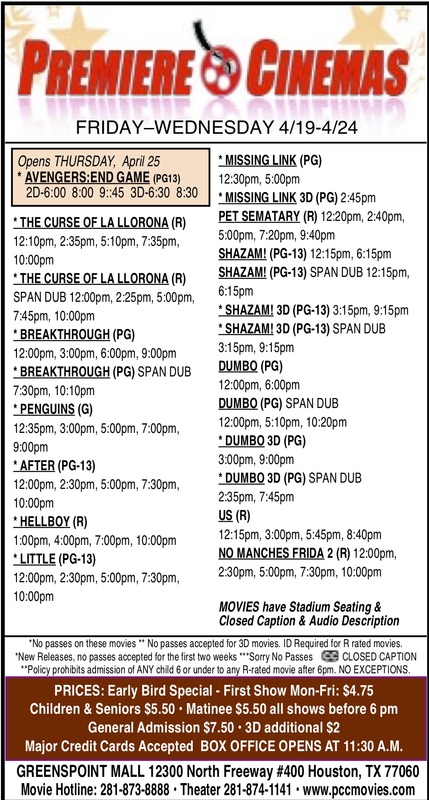 For to go orders please call 281-617-7152, more specials at El Peon ad on page 8. In 2000, an Early Childhood and Prekindergarten Center, de Santiago was named to honor Jose de Santiago, an Hispanic who has dedicated his life to help the community when he can. Jose de Santiago and his wife Gloria, had been active supporters of little league, Optimist Chicken Club and more. His metal fabricating business provided a clubhouse for the kids. A friend of the school board recommended Jose’s name on the new school for his hard work in supporting the community. De Santiago EC/PK & Head Start Center, an Aldine ISD school, is located 1420 Aldine Meadows in Houston. 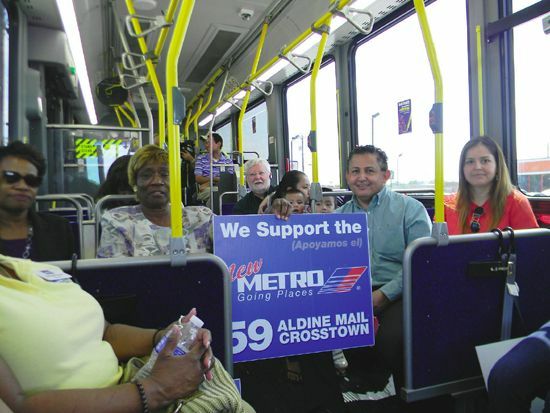 NORTHEAST – Last Friday representatives of METRO, members of the East Aldine District, community leaders and neighbors met for a demonstration ride of the extended METRO route 59. Starting Monday, August 27, METRO extended route 59 to include stores on I-45 North Freeway by West Rd. The extended Route 59 known as Aldine Mail Crosstown will start at Aldine Mail Route in front of the Social Security Office, continue on Aldine Mail, then on Airline Drive the bus will turn to the right, then left on West Road, a right on I-45 North’s feeder, continue traveling to Aldine Bender making a U turn to finish at the Walmart store. Including Aldine Bender will give a closer distance to LSC-Greenspoint Center for students and to Immigration Services. Art Murillo, representative of METRO, said that two bus stops may be added to this extended route; one by the intersection of Airline and West Rd. and the other on North Freeway’s feeder, in front of Walmart to provide a closer distance to the store. Buses run Monday through Friday, starting at 5:30 a.m. on Aldine Bender eastbound, and 6:06 a.m. starting at US59 westbound. They run for about 12 hours each day, until about 5:58 p.m. from Aldine Bender eastbound and 6:06 p.m. from US59 westbound. NORTHEAST – The East Aldine District took a major step toward establishing a new town center for the district, by purchasing 61 acres of undeveloped land in the middle of the commercial district of Aldine Mail Route. The district board took action at their last meeting, on Tuesday night, Aug. 21, to conduct a survey of the land and an environmental study, prior to finalizing the contract, according to David Hawes, East Aldine president. The land is being purchased from Clinton Wong of Hanover Limited, through broker Caldwell Companies. Caldwell conducted a thorough study of available sites before recommending this one, Hawes said. The site is strategically located in the middle of commercial and residential areas of the East Aldine district, and on the 59 Bus Route. It is easily accessible from the Eastex Expressway, and is adjacent to Keith Wiess park. It is expected that the development will recognize the site as a major entrance to the park. Preliminary planning sessions, with Hawes, district chair Gerald Overturff, district services director Richard Cantu, and a facilities committee led by board member Gilbert Hoffman, have identified a number of prospective uses and tenants for the site. It is expected that these would be partners in the development work. These include a new college building for Lone Star College-North Harris, a Public Safety building that would house the Harris County Sheriff’s storefront operations and many other services, a Recreation Center, and a Civic Center building to house East Aldine District offices and other government functions. Other partners that might be interested include the Houston Parks department, and the YMCA Greenspoint. The development might also include retail stores and restaurants, to bring a real “town center” feeling to the development, such as can be seen at The Woodlands and Sugar Land town centers. Although the extent of development is preliminary, potential participants have suggested large development needs. Lone Star College might need as much as a 100,000 square foot building, similar to the Greenspoint facility. Harris County Sheriff’s Department is considering moving major departments to the site, including the county-wide communications division, traffic unit including motorcycles, and the detective bureau. It has even been mentioned that an emergency back-up facility for Trans-Star could be built here. The Civic Center building might include offices for congressmen, state legislators, the Chamber of Commerce, and even county offices and court house functions, according to Richard Cantu. It would also be a place for non-profit agencies to have permanent offices and meeting facilities. Recreation facilities might be indoor and outdoor, including an Olympic size swimming facility. In addition to all these buildings, surface parking and garage parking would be needed. The East Aldine District expects to close on the property within 90 days, and then begin the planning process. They will pay about $4.291 million dollars for the site, financed by loans and cash on hand, according to Hawes. The financial report to the board for this month indicated that income from sales tax collections was running above projections, and that the annual budget of $4 million dollars will probably be exceeded this year by $1 million, and perhaps more in future years as the economy improves.